« Amanda Browder’s Installation Rocks! Former Chelsea gallerist and 2011 Protocinema founder/director Mari Spirito, creates pop-up spaces in New York and Istanbul to host site-sensitive works of emerging and established artists. 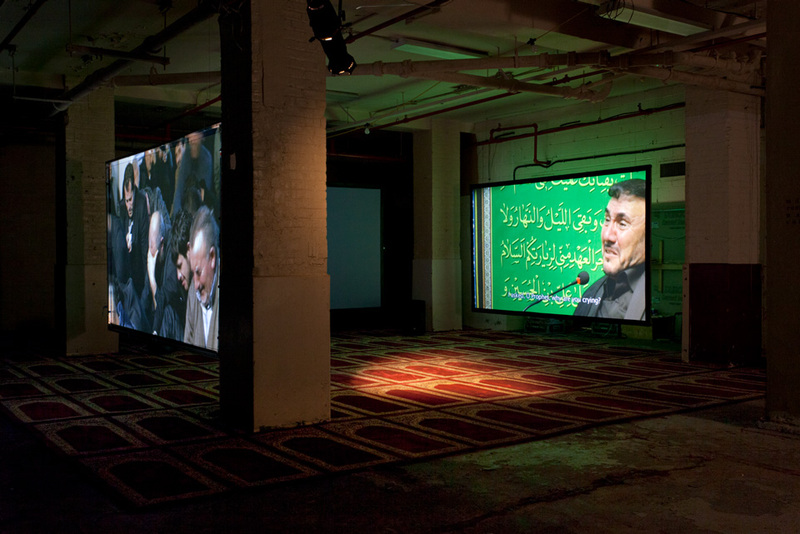 The most recent, Ashura, a four channel installation by Turkish artist Köken Ergun is installed in a stripped down basement that mimics the site in Istanbul, where the actual ritual occurs. The reenactment by Shi’a devotees is of the martyrdom of Imam Hussein –grandson of prophet Muhammad, and central figure in Shi’a religion. In Ashura, Ergun provides the viewer an intimate look at both the dramatic and humble elements that this sacred ritual encompasses within a cultural tradition that maintains its autonomy within the majority Sunni population of Turkey. Challenged by a level of piety, and its attendant focus, on display–men crying during the recitation of the martyr narrative– I initially found it difficult to fathom likening the performance to a Passion Play. Yet it is this visible devotion, and its bodily surrender as well as its necessity to the participants as cultural glue within their group, which holds the viewer captive on the vast prayer rug; possibly the same rug in the video where the ritual is performed. Since 9/11, Islamic images of devotion and its differences from the Judeo-Christian tradition- have forged their way into Western consciousness giving rise to introspection regarding the nature and place of religious fervor and faith. On a deeper level that which cannot be fully measured or quantified, forces secularists to question what ultimately gives meaning to our lives in lieu of ever more fleeting notions of sanctity and stability.